Make everyday and seasonal candles sparkle and shimmer! 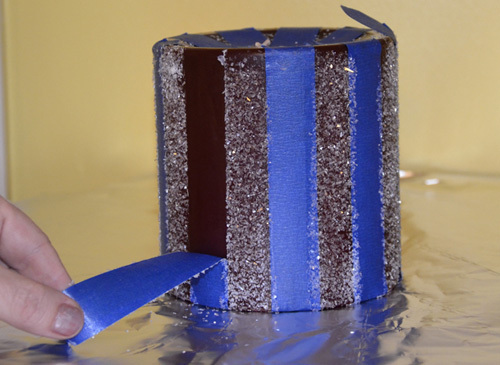 This is an easy candle making project and leaves the door open for limitless creativity. You can start with a candle you made yourself or a candle purchased from the store. 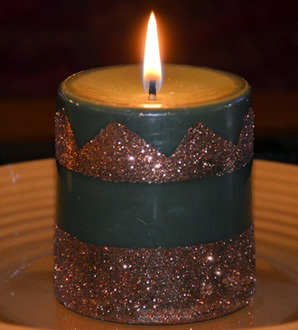 This project allows you to make any candle your own with color, sparkle and design. 1. 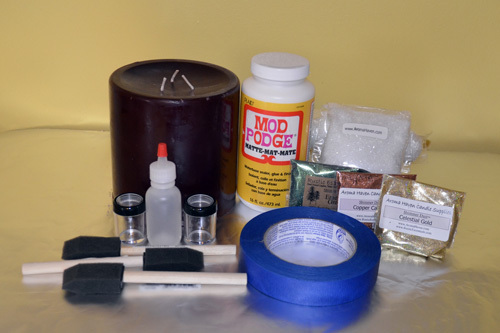 Gather items needed: A finished candle, painter's tape, Mod Podge in Matte Finish (available at craft stores or Wal-Mart), Rustic Escentuals' Dazzle Dust and glitter, a paint brush, glitter spritzers or shakers, and newspaper, tinfoil or wax paper to cover work surface. 2. 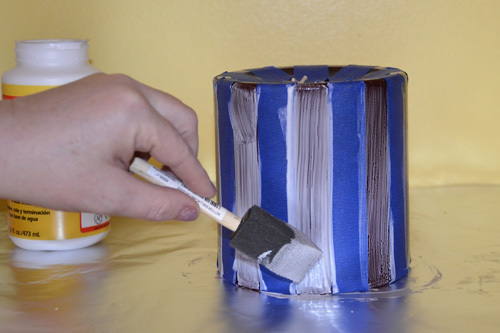 Tape your finished candle with the painter's tape. Be sure to press down all tape to make sure it's completely adhered everywhere (otherwise Mod Podge will leak underneath it). 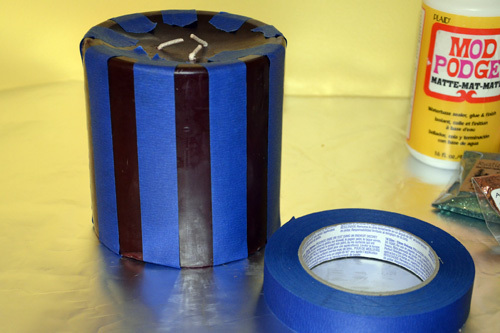 You can lay and layer the tape in any creative design you wish or even tape on stencils. For this tutorial, we are doing stripes to keep it simple. Note: Do not work on the top - only the sides. 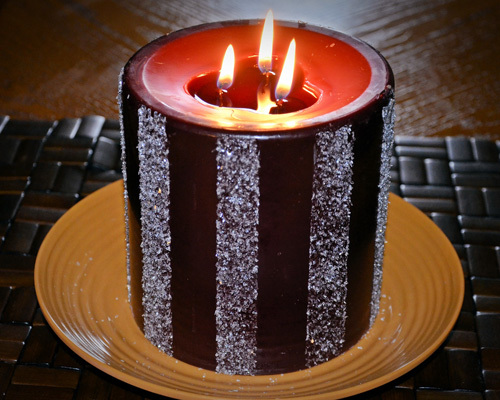 Too much glitter or Dazzle Dust can clog a wick, so remember that you're doing this candle project for decorative purposes to enhance the sides of the candle. 3. Carefully paint the candle sides with generous amounts of Mod Podge. Remember - the more glue you put on, the more glitter and Dazzle Dust will stick to it. Try to not get streaks (the finished product will appear streaky). If you move the candle around, do so by holding the wicks or placing your fingers on the painter's tape so as not to disturb the glue. 4. 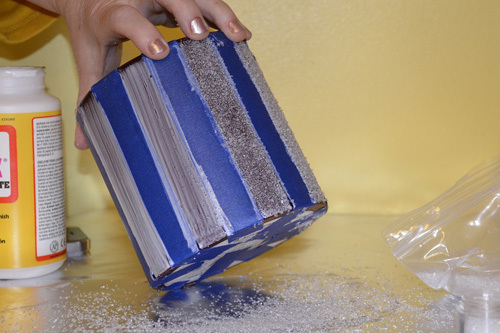 Sprinkle glitter and/or Dazzle Dust onto the glued area. For this demonstration we used Star Dazzle Dust mixed with a tiny bit of iridescent Diamond Dust glitter for extra sparkle. It's okay if the excess glitter and Dazzle Dust goes everywhere - this is why you covered your work area! 5. Let dry. Peel off tape. 6. Finished and ready to display or package! Note: The candle on the right is one we made using the above instructions but used Copper glitter rather than Dazzle Dust. Also, it helps tremendously to add a pinch or two of the iridescent Diamond Dust Glitter to any other glitter or Dazzle Dust you're using - it adds enormous depth of color and sparkle. Great floral scent. I made a soy candle in this scent and it has a good hot throw. I love this scent. It is very light and fresh smelling. Very unique. It did accelerate and got think really fast, but the scent is so worth working fast. Will definitely order again.